Back Row:- Lt. A.G. Martin-Pereira, Lt. A. Plumb, Lt. W.F.H. Ansell, Lt. Son Kho Pao, Capt. Y.V. Barr, Lt. Nyunt Lwin, Lt. J. Hla Shein, Lt. Mg Tut, Capt. T.G. Hunter, Capt. J.E. Ady, Capt. A.E. Ady, Capt. J.J. Rainey, Lt. Sohan Singh, Lt. H.G. Munro, Lt. H.A. Roberts, Lt. F.W. Pais, Lt. A.W.J. Mullerworth, Lt. A.B.J. Lynn, Lt. Nang Zing Naw Lah, Lt. G.A. Hyde, Lt. G.N. Hogan. Middle Row:- Cap.t A.M. Smart, Capt. B.T. Lidbetter, Capt. Kasim Shah, Capt. Sein Tun, Capt. Saw Lader, Capt. D. Talmadge, Lt. D.R. Sen Gupta,Lt. Hrang Thio, Capt. P.B. Neale, Capt. F.B. Newbould, Capt. C.A. Steevens, Capt. J.F. Robertson, Capt. G.B. Down, Capt. H.S. Bourne, Capt. W.D. Hardless M.C., Lt. Dal Za Kam, Lt. J.C.G. Da. San Marino, Lt. Thompson, Capt. J.W. Eadon, Lt. Lian Nawn, Lt. P.T. Fforde. Front Row:- Capt. J.M. Breckenridge, Capt. A.C. Gowan, Capt. N.G. Watson, Capt. L.H. Low, Maj. G.S. Neville, Maj. W.R. Andrews, Maj. J.H. Gemmell, Maj. M.A. Freshney, Lt.- Col. P.C. Buchanan MC, Maj. W.D. Griffiths MC, Maj. R.S. Carey OBE, Maj. H.W.P. Graham, Capt. F.W. Burn, Capt. Chit Khin MC, Capt. E.J. Edwards, Capt. J.B. Harman. 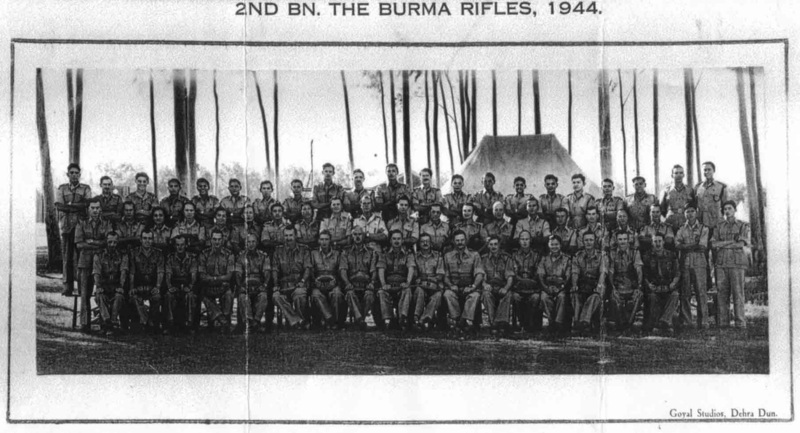 Karens, Kachins, Chins and Gurkhas, with their officers. The Officers must be from the above photo, which was taken the same day. Four can be identified - Capt. C. A. Steevens and Capt. J.B. Harman. Major H.W.P. Graham (19th from left, 2nd row) G.W.T. de Mattos (23rd from left, 2nd row.) Only one of the men can be named - Thuam Za Gin. If you can identify any of these men, please contact us.